On Kscope 14 Oracle announced that ODI 12c would not have support to Planning/Essbase and HFM. You people could imagine that this bomb would make a lot of noise in EPM world. Because we did not liked the ODI 12c interface, we did not care too much about this announcement, but after Oracle post this: https://blogs.oracle.com/dataintegration/entry/using_odi_12c_for_data, we heard a lot of users complaining about it. 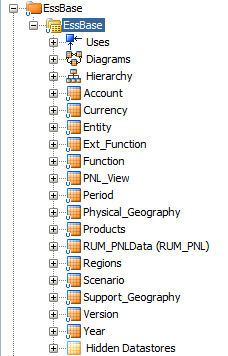 Also we thought a little about our dear users and imagined how our beautiful ODI environment that orchestrates the entire EPM environment would look like if we had to create a lot of extra steps to export data from tables to files and use some CMD commands to load it into Planning/Essbase/HFM. We decided to make some tests to see if we were able to use ODI 11 KMs with minimal changes to them (in order to increase acceptance of this method), and do our part to help the EPM world. 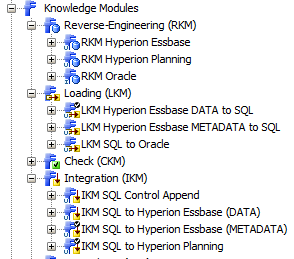 After a couple of hours (it was more like 6 hours…) we figure out how to make the KMs from ODI 11 work with minimal changes in ODI 12. Let us stop talking and start showing what we need to change to make ODI 12 compatible with EPM. Technologies We do not need to import or change anything in the Technologies tree because Oracle left all the technologies for the EPM tools there. We do not need to change or copy any Jar because Oracle was kind enough to maintain them there. 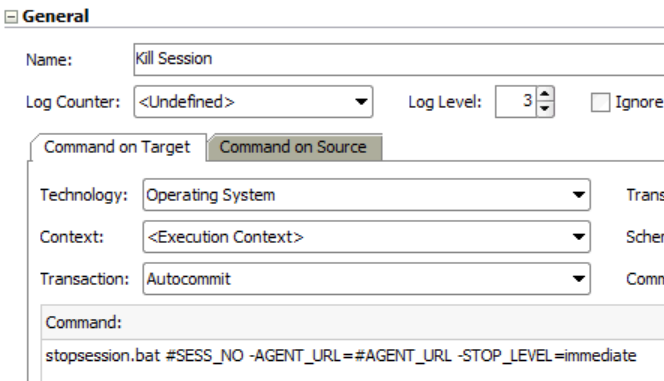 The only thing we need to do is to Import the EPM KMs from the ODI 11 to ODI 12. KMs We have seven KM that we need to import from ODI 11. After we import the KMs, we need to changes a few things on them. 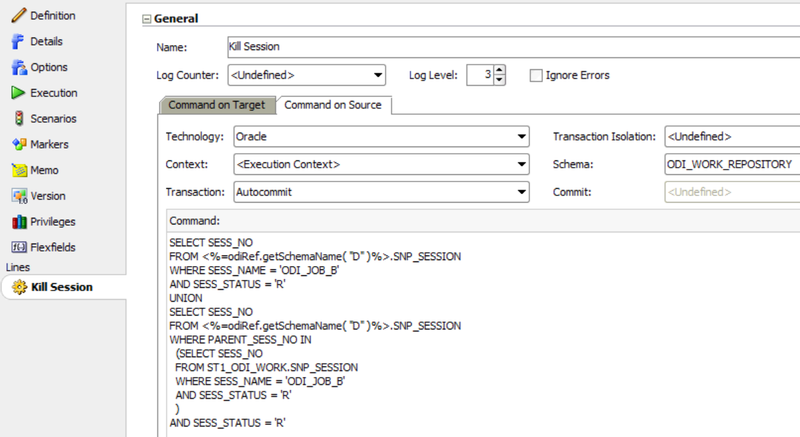 In the RKMs we saw the first changes Oracle did in the way ODI works. In the 11 version, ODI used the <%=odiRef.getModel(“ID“)%> substitution method to get the ID of the model there we would like to reverse. 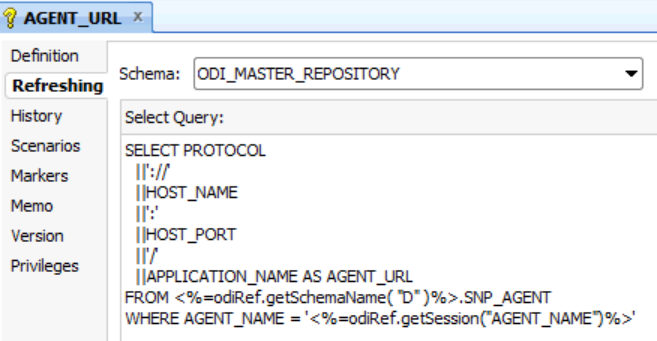 If we take a look in the master repository, in ODI 12 we’ll see a new column in the table: This is the first thing we need to update in the RKM. ODI 11 used the ID, and if you try to use it as is, Oracle created a validation that makes the interface fails. (It was a good error message because we could figure out the problem reading it). Then, basically we need to update it to the new GLOBAL_ID. We need to update the code to the new standard and also enclosure the substitution method with double quotes because now it returns a string instead of a numeric value. We need only to update to GLOBAL_ID. 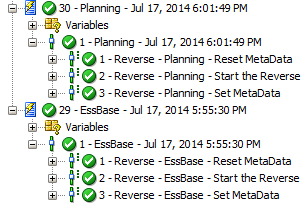 For the Planning KM we just need to update the code exactly in the same way we did in the Essbase KM. After this, just create a model and reverse something to test it. With this we are ready with the RKM part and we can start to create interfaces. Sweet. 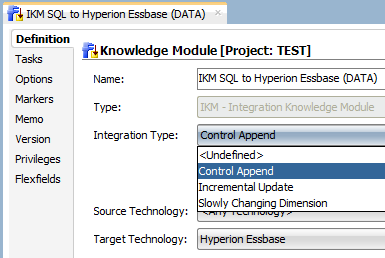 We choose “Control Append” since the EPM IKMs does not have any type of integration strategy, but really does not matter with one you choose (I just like things organized). Same thing for the Planning IKM. Add the Integration type. (We chose “Control Append“) We are done with the IKM part. There is no change in this KM. Works as is. I like it. This was the tricky one. And not because it’s too different than the others. In fact, if it was not for a BUG in the API it would not need any changes to make it works (On Monday we will open a SR with Oracle about this bug). 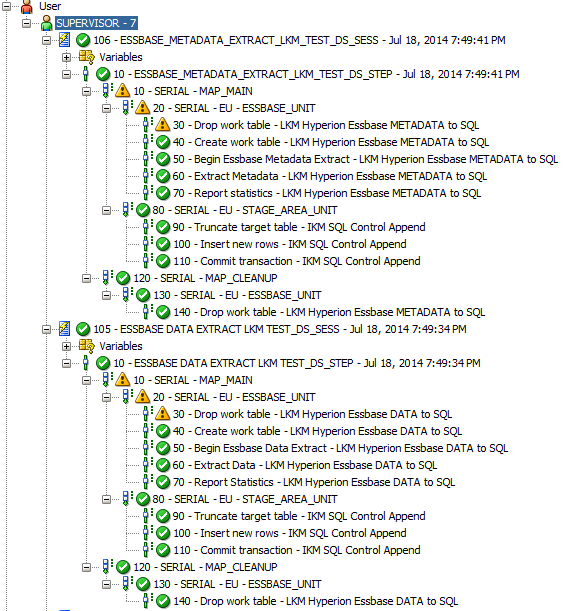 This command basically create a mapping between the temporary table and Essbase to start the extract. Essbase and its API is case sensitive with this information, and the pattern COL_NAME, in this version, seems to be bugged or changed the behavior (that I do not believe is the case, I will explain later). 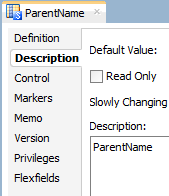 The pattern is always returning in Uppercase, even when you change the execution to Stage or Target areas, and because of this, we got an error saying that the member PARENTNAME is not valid for the dimension XXXXX (And this does not happen in ODI 11 if you set the execution to Stage or Target areas). 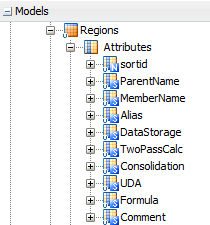 Anyway, we start to test the behavior and we found out that in ODI 12 it is impossible (by now) to create an Oracle table like this: Because the pattern COL_NAME always return, uppercase no matter what and it removes the double quotes from the expression. This is why we think it is a bug, because it removes a functionality from the Oracle DB as well. After this, we just need to copy the column name to the description inside the attributes in the model: Double clicking the column, it will open its properties and in the description tab we only need to copy the name of the column to its description because the COL_DESC will get exactly what is written there (with one exception: if you put a quote or double quotes it will turn it in space, but we will not use it here). This workaround does the trick: Yes, we know that we could use a lot of other methods, as Flexfields for example, to do this or even do some code changes in the KM, but the idea here is to show that is possible to use ODI 12 with minor changes. 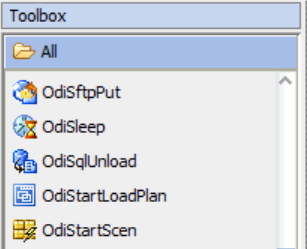 And with this we can use ODI 12 in our EPM environment just like we do with the 11 version. We didn’t test HFM here because we don’t have it installed in our infra, but probably the amount of changes for HFM is the same as it’s for Essbase and Planning. We hope you guys like this and please give us any feedback if you guys implement this solution. 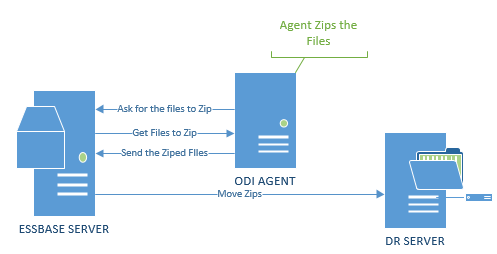 As far as we test it, it should work exactly like ODI 11. About the Case sensitive issue of [COL_NAME]. 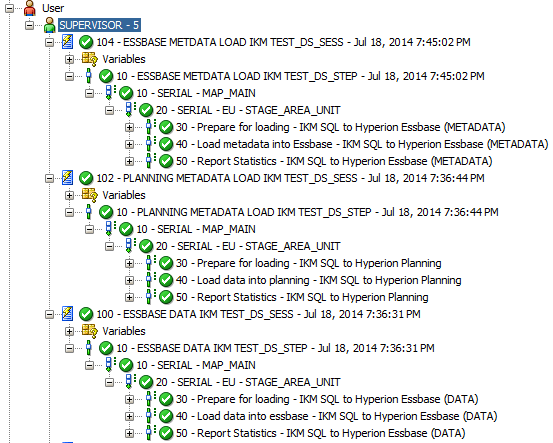 We installed the ODI 12.1.2.3 today and repeated the tests we did in the previous version. The [COL_NAME] for IKM is working, and that means, the issue to create an Oracle table with 2 columns with the same name but different case is solved. But the [COL_NAME] for LKM still doesn’t works. All LKM have the same behavior and we can see that in the logs when we tried to replicate the IKM behavior in a LKM. For now please stick with our workaround until Oracle fix this in the LKMs.